Contrary to myth, Pennhurst was not a place where evil people wrought intentionally evil schemes. But that makes the meaning even more relevant and the danger even more real: the neglect rising to the level of abuse described in the groundbreaking Pennhurst litigation excerpted below was perpetrated by our own society, in our own backyard, within our own lifetimes. 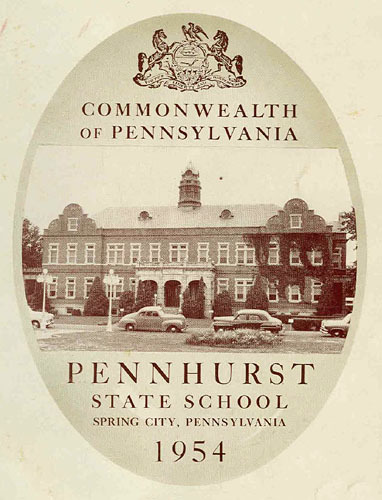 As a former Special Assistant to Pennhurst's Superintendent has said, "Pennhurst was a mistake from day one, but it was a mistake made by all of us, following the dictates of the 'best minds' of its time." Against the backdrop of the state's neglect, countless unremarked acts of kindness from workers and families added bits of humanity to institutional life. It is, no doubt, the resilience of Pennhurst's residents themselves that is the most inspiring part of the institution's story. 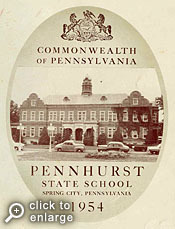 Originally known as the Eastern Pennsylvania Institution for the Feeble Minded and Epileptic, Pennhurst was once seen as a model institution. It was a product of a self-proclaimed "progressive" era when the solution to dealing with disability was forced segregation and sterilization. Since the 18th century - a similarly self-proclaimed age of enlightenment - people with illness and disabilities were labeled "defectives." As late as 1820, such "defectives," along with other dependent "deviant" groups such as aged paupers and the sick poor, were grouped together and sold to the lowest bidder. A similarly conceived philosophy of disposal at the lowest cost was played out time and again at Pennhurst. If only slowly and person-by-person, a growing and maturing society reconsidered this philosophy. History written at Pennhurst demonstrated that what was once held out as the only right option was in fact hopelessly wrong. In contrast to the narratives of intense and prolonged tragedy, Pennhurst's largely untold stories of deep compassion and great character evidence a rise of kind conscience that inspires yet today. One Pennhurst staff member recalls how she and others would volunteer their time on Saturdays and Sundays to clean the residents - many of whom could not toilet themselves - since the state budget did not allocate for housekeeping services on weekends. Another describes sharing holidays at her home with Pennhurst residents whose own families had long since stopped visiting. 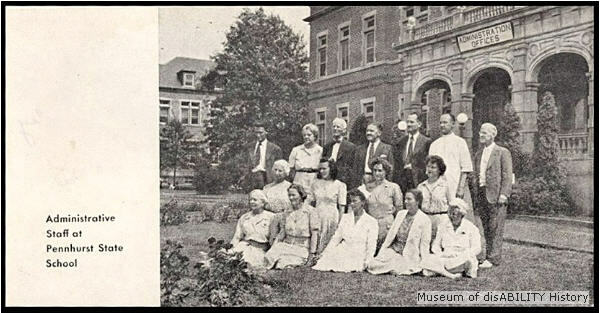 But, also as shared by a former employee, there is another, rarely considered aspect to the Pennhurst story that is perhaps its most important: the indomitable and unbreakable power of the human spirit displayed every day by the residents themselves. "The residents lived lives of inner dignity and grace in a world designed to strip that dignity from them." Despite the obstacles institutionalization presented, many of Pennhurst's residents found ways to prosper. "They lived lives of inner dignity and grace" in an ammonia-washed world designed to strip that dignity from them. "This was especially true of the individuals who made up the "working patient" group. Day in and day out, they proved their worth helping to care for their worse-off peers by assisting the paid staff in nearly every aspect of life at Pennhurst. Even the most severely disabled found ways to assert their individuality and retain their humanity in the face of a system that dehumanized them in a million different ways. Many people who were told for years that they could not succeed beyond Pennhurst's gates proved the "professionals" wrong, going on to live independent lives of worth and value in the community long after the administration building's great oaken doors slammed shut for the last time. Just as we remember the sadness, we need also acknowledge these quiet triumphs of the human spirit. Click here to review the complete transcripts from the Halderman vs. Pennhurst case.